April 20, 2017 – The National Consortium on Aging Resources for Seniors’ Equity has released its first fact sheet highlighting four best practices for working with diverse older adults. This resource is based on a thorough knowledge of the unique needs and concerns of diverse older adults. 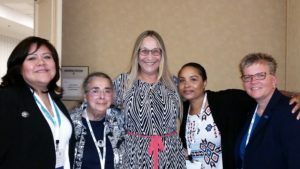 The National Consortium on Aging Resources for Seniors’ Equity is composed of five national minority aging organizations, each of whom represents one of five major racial, ethnic, and LGBT minority older populations, serving as an interconnected resource center for the Aging Network. Consortium members include the National Association for Hispanic Elderly (Asociacion National Pro Personas Mayores – ANPPM), the National Asian Pacific Center on Aging (NAPCA), the National Indian Council on Aging, Inc. (NICOA), the National Resource Center on LGBT Aging (SAGE), and the National Caucus and Center on Black Aging, Inc. (NCBA). The Consortium fact sheet provides insights and techniques about effective outreach and meaningful involvement with a person-centered approach in serving diverse older adults, aimed at providing guidance to the Aging Network. It also offers an inclusive vision of both the strengths and disparities of each community, while creating solutions and advocacy focused on older adults. The fact sheet cites that 1 in 5 older adults in the U.S. is a person of color or American Indian/Alaska Native. By 2040, 1 out of 3 older adults will be a person of color. Diverse older adults face disparities because of discrimination; service barriers, such as language access; cultural issues; and exclusion within data collection and research, while 3 out of 8 LGBT adults are older adults. The National Consortium on Aging Resources for Seniors’ Equity works to decrease the prevalence of disparities among racial, ethnic minority and LGBT older adults, their families and caregivers, by providing technical assistance to the Aging Network. Established in 2012, the Consortium is funded by the Administration on Community Living (ACL). Each member of the Consortium shares their distinct strengths and culturally competent expertise for the benefit of racial, ethnic, and LGBT older adults, their families and caregivers. The National Caucus and Center on Black Aging Inc.